Nate, Tom and Doug started Cutting Edge Builders with the goal to set themselves apart in a market filled with great competition. Servicing the greater Grand Rapids area and the lakeshore, we are a company dedicated to an innovative approach to meeting your new construction and remodeling needs through the use of the latest and best materials and construction techniques. We are also firmly committed to completing your project with the highest level of traditional craftsmanship and unmatched attention to detail. We are a hands on builder which means we will be on site personally overseeing and much of the time doing the work. Finally, we are committed to being one of the most educated and experienced professionals in our market. To consistently make a profit delivering residential new construction and remodeling services at competitive prices while maintaining a high level of traditional craftsmanship and employing an innovative approach incorporating the latest materials and construction techniques. Use of quality building products, the best construction techniques available and superior workmanship in every project. Attention to our client's needs and desires from the first meeting through the warranty period. Maintaining continual and open communication with our clients, keeping them informed of issues and addressing their concerns in a timely manner. Managing each project with extreme care and attention to detail. Completing all work on time in keeping with the schedule communicated to the client at the beginning of the project. Minimizing any disruption and inconvenience in the lives of our clients caused by the project. Making the building and remodeling process as enjoyable and educational as possible for the client. Providing an investment with which the client is delighted and proud to display to their friends, family and neighbors. We welcome the opportunity to put our experience and innovative approach to work for you. Nate graduated from Taylor University in 2000 with a BS in Business Systems. He worked in the fast paced computer field on the tail end of the .Com boom and as that wound down he found himself unemployed. Having become increasingly restless in the computer field and looking for a change, he started working with a friend in construction and quickly found his passion in life. He moved to Michigan in 2002 to marry his college sweetheart and began working for a small local builder where he really began honing his skills as a true craftsman. 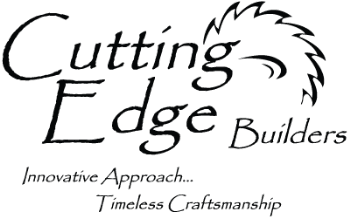 Nate is a very detail oriented carpenter and as such, he loves creating timeless craftsmanship that Cutting Edge and their clients will be happy with for many years. Since the construction industry is no less fast paced than any other, he also brings valuable business education and experience to the company. Nate is also our in-house CAD designer and loves to work closely with clients to blend their ideas with our experience to come up with custom solutions to fit the client's needs and desires. As a designer of many homes and high end additions/renovations, Nate is a valuable asset to Cutting Edge and our clients. Tom got his start in construction with his education at Lane Community College in Eugene Oregon where he attended the Construction Technology program. He continued his education working for a local contractor in his hometown building high end rustic style lake homes for out of town clientele. He also spent a year renovating rooms at the Winchester Bay Inn in his hometown, gaining valuable experience in a wide variety of trades, making him invaluable to Cutting Edge in the area of quality control. Although Tom is skilled in many trades, he is a fine craftsman and his true passion is being a trim carpenter. He loves a challenge and always tries to incorporate something new in each home he trims. With his education, passion and unique experience, Tom is a valuable asset to the Cutting Edge team. Douglas graduated from Hope College in 1993 with a degree in business and economics and earned a masters degree in accounting from Western Michigan University in 1995. He obtained his CPA license and worked for BDO Seidman, a national accounting firm, both in the Chicago office and Grand Rapids office. Although he enjoyed working on high profile clients such as Alticor, Steelcase, and Blackwater USA, he decided to pursue his first interest, building and construction. Doug worked for a local builder learning the art of being a general contractor. Douglas brings valuable administrative, sales, and estimating experience to Cutting Edge Builders. He considers himself a life long learner and has obtained the most professional designations through the National Home Builders Association of any builder in West Michigan. He also holds a Michigan real estate license.